1. Preheat the oven to 220°C, gas mark 7. Put the squash, onion and fennel in a roasting tin. Season and toss through 2 tsp olive oil. Roast for 15 minutes. 2. Meanwhile, cook the barley according to pack instructions. Drain and toss in the garlic, orange zest and juice. Season. 3. Coat the chicken breasts in the cinnamon and remaining olive oil; season. Sit them on the par-cooked vegetables and bake for 20-25 minutes, until the chicken is cooked through. 4. 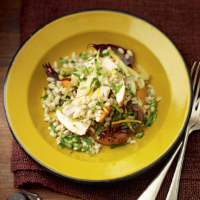 Slice the chicken, then toss it with the barley, parsley and vegetables to serve.